Got my replacement polishes and finished my swatches! Covered in Diamonds. This is a really interesting glitter. 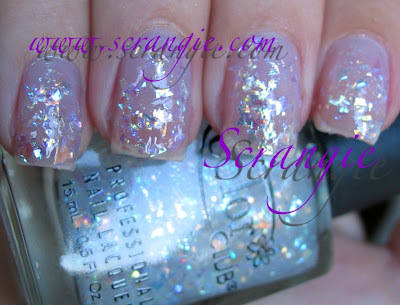 It's a clear base with varying shapes and sizes of clear opalescent mylar glitter. To give you an idea of the texture, think of those horrible NYX "Avenue" polishes, how they're filled with those little irregular chunks of plastic. This is similar but much, much nicer. These pieces are mostly flat and very densely packed so you can actually do one coat and have a good amount of glitter end up on your nail. It's a little difficult to apply- it's extremely thick and a lot of glitter will end up on your nail so you have to spend a little time smoothing it out with the brush. The end result is quite pretty over certain colors but I prefer it alone. It looks like ice crystals and flashes blue, green, gold, yellow, red orange and purple! In fact... this is made of the same stuff the fake snow they use in Christmas displays at the store is made from- opalescent Mylar flakes. Ms. Hautie. I hate to say it, but this polish just doesn't work. The base is too thick and frosty and the glitter is too fine, so when combined and applied it just looks... lumpy. Chunky. Not so hot. In the second picture you'll notice an amazing pink duochrome in the bottle. Sadly, it does not seem to show up on the nail. It looks great while you're applying it before it dries, but I can't seem to make this work for me. It's a metallic grey/silver frost with teeny tiny hologram microglitter. Red Velvet. Black base with red glitter. While this polish is very beautiful, I can't say it's unique. It's another China Glaze Lubu Heels clone. Worth getting if you don't have any of the other similar shades. Resort To Red. A frosty medium red. This particular shade of red doesn't really speak to me, and combined with the frosty base it's a color I would normally never wear. However, it does have a redeeming factor- when you apply it to your nail you'll see glints of iridescent color sparkling at you- almost like a microglitter, but so small I can't even make out definite particles. Snakeskin. This one is really nice. It's a metallic silver base- not quite a true foil but with definite metal properties. It has a strong green tone to it but it's still mostly silver/grey. The best feature is the tiny gold microglitter. It all combines to actually give the appearance of true snake skin. Crazy! Really pretty and not lumpy like the others! Untamed Luxury. The star of the collection! 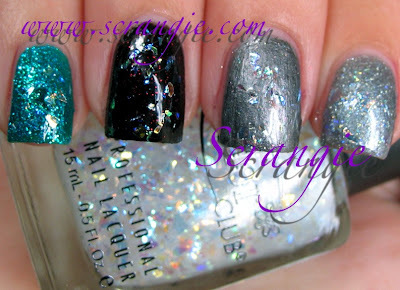 A breathtaking jewel-tone glitter. It's a blue-green... aqua... turquoise? It's a bit like the color of Zoya Charla- blue green fusion. Super hot amazing! Very flashy. The glitter is suspended in a sheer matching color base, which I feel adds depth. I experimented a little using Covered in Diamonds over the other shades in this collection and ended up with a couple unexpectedly pretty combos! Left to right (pinkie to index): Untamed Luxury, Red Velvet, Ms. Hautie, De-Luxe-Cious. Wild Orchid, Pretty in Platinum, Snakeskin, Resort to Red. Ready to Royal, Nothing But Truffle, Soft as Cashmere, Positively Posh. Chunky but pretty! Certain polishes seem to make the glitter sink down and create holes while others hold up better and let the glitter sit on top. My favorites for layering with Covered in Diamonds are Red Velvet (how pretty is that combination?! ), Ready To Royal, Wild Orchid, Untamed Luxury and De-Luxe-Cious. The formula on these was fine- same as the other half. The only one that's different is Covered in Diamonds which could benefit from some three-free thinner, but that might make the glitter application more sparse. It takes a little work to get that polish just right, but I really like the look of it. Every time I see Untamed Luxury, I love it even more. =) Beautiful color. Untamed Luxury has my name all over it. Damn that's hot! I confess I got a bit disappointed as well. Specially because this collection was a bit secretive before it's release so it seemed like it would be perfection. But I did like, ready to royal, deluxelicious and untamed luxury. I don't know how I feel about covered in diamonds yet. Untamed Luxury obviously is the stand out in this collection; I like Colored in Diamonds in the pictures, but I would have to see this in person, you know? Too bad those glitters are gritty...ugh. Red Velvet isn't terribly unique, but I like it. I'm kinda meh about this collection. There are only 1 or 2 that jump out at me, otherwise, this is a no-go. Bleh, aren't there any purples coming this fall (apart from the one in the CG Halloween-collection)? Purple seems like such a secondary colour... why, I'll never know. I'm peculiar like that though. Question: Could you do a compare of Red Velvet, Lubu Heels and some other clones? I'd like one of them, but I don't know which one. Every time I see Covered In Diamonds I can't help thinking of Lush's Christmas bath bombs and all the plastic glitter shrapnel that ends up in the bathtub... It's pretty, but I wish they'd done large flakies instead. Even though it has some clones, I like Red Velvet. Maybe I should finally get CG Lubu Heels or RBL's Black Russian. Which of the three do you prefer? I really like Snakeskin! Think I'm gonna go for that and Untamed Luxury! I like some of the colors from both collections. 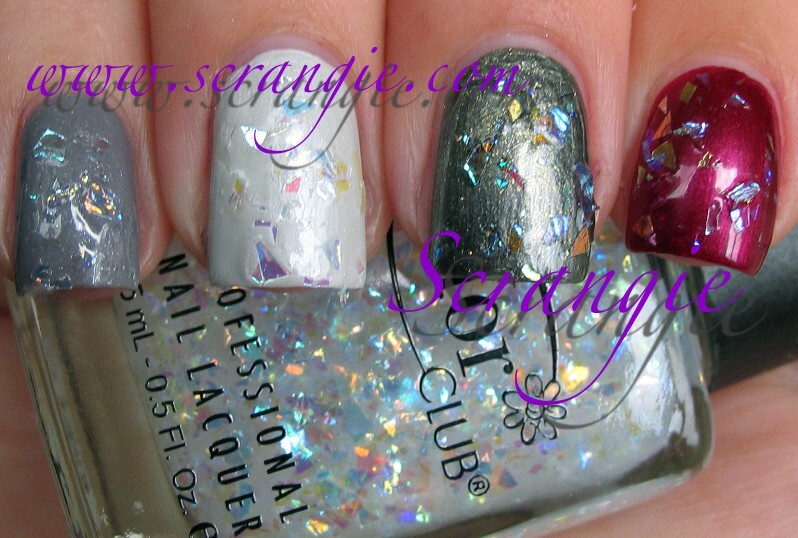 I too would have liked to have seen some holo's in the fall collection. It's not a total disappointment,however, I have to admit I am underwhelmed. I think I'm going to like most of these. Snakeskin is the unique goody I'm looking forward to swatching first. Ms. Hautie was tricky. Two coats looked really textural and the a third coat magically corrected the problem. I have no idea how that happened! I had a similar experience with De-Luxe-cious. I kind of wish Red Velvet was done with blue glitter instead. You wear those types of shades so well! I am really looking forward to trying Untamed Luxury. So gorgeous on your nails! I am very disappointed in this part of the collection. I might buy Untamed Luxury. Ms Hautie is hideous! It's so bumpy looking. That usually doesn't bother me. For some reason it bothers me this time. Covered in Diamonds as a topcoat reminds me of those commercials w/ the glass shard popsicles, haha! Oh my god, a whole set of glitters a la Slamming Red? That would be incredible. Do it CC, do it! It IS another one of your companies. And more holos! Oh wow, I hadn't heard of this set at all and just picked up Snakeskin and Ms Hautie today. Ms Hautie looks incredible in the bottle - maybe they fixed it after they sent out the blogger copies? It doesn't look like it could be frosty at all to me, so I'm crossing my fingers that they've changed it. I haven't seen these reviewed at all anywhere else! Man oh man, you're killing me with your blog. I just had to go and look for Color Club in Soft as Cashmere. 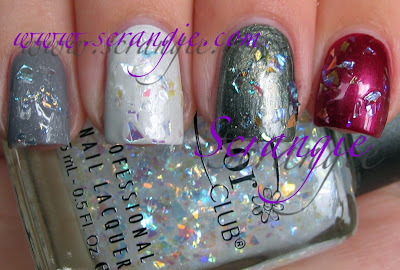 My next goal is to find MACs polish in Dry Martini for less than 20 bucks! !